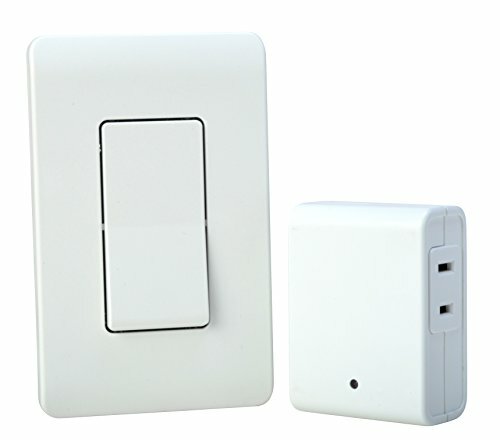 The Woods 59773 indoor wireless wall switch remote turns plugged-in device on and off from up to 80-feet away. To maximize range use with a clear line of sight. Operate home appliances from across the room. Turn on a table lamp before you enter a dark room, turn off the holiday lights at the doorway, operate fans and so much more. The easy to use transmitter is ideal for anyone who just wants a one-touch, convenient way to turn lighting or appliances on and off. The Woods 59773 wireless remote with wall switch offers a fast, tool-free set-up and is easy to operate by the simple touch of a button. The Woods brand of timers and home controls bring simplicity to your life, by maximizing convenience, security and energy SAVINGS.